Grow vibrant blooms using Dalefoot’s new peat free Bulb Compost with no need for extra feed! A new peat free Bulb Compost, made from wild bracken harvested from the Lake District fells, has been launched by Dalefoot Composts. Dalefoot has developed this premium, carbon-neutral compost with award-winning lily growers HW Hyde & Son who have used it to grow ‘gold medal’ bulbs at RHS Chelsea Flower Show. The compost itself has now been shortlisted for RHS Chelsea Garden Product of the Year 2018. It boasts the perfect blend of free draining compost with natural, must-have nutrients and trace elements, to grow eye-catching flowers and to feed the bulb restoring its reserves for the following year. The bracken from the Cumbrian fells also gives it the perfect open structure. The growing number of eco-conscious gardeners will welcome news that Dalefoot’s Bulb Compost provides a beneficial use for aggressive, waist-high bracken which makes grazing difficult and impacts upon native species. Harvesting bracken on rotation, at exactly the right time of year, improves the habitat for ground nesting birds and butterflies, in particular the endangered High Brown Fritillary whilst also providing the perfect nutrients for beautiful spring, summer and autumn bulbs. 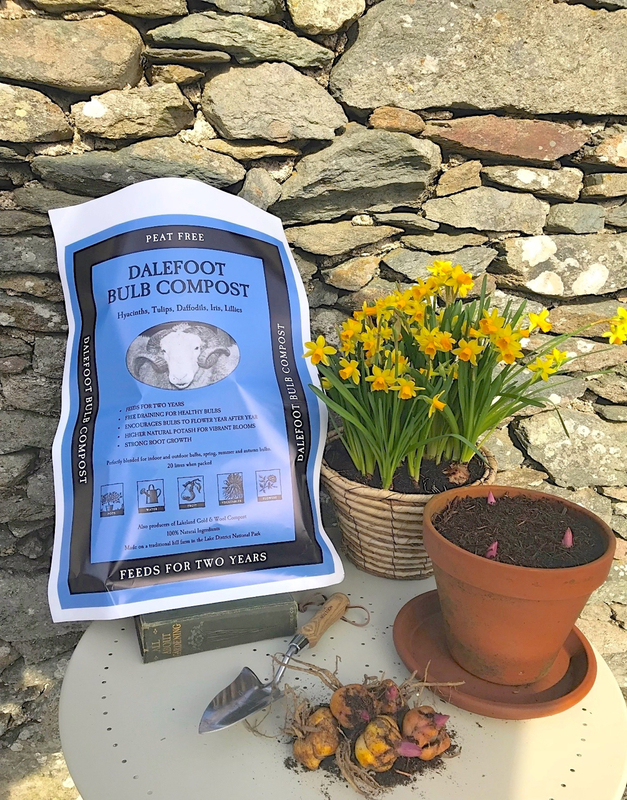 Celebrating its 21st year, Dalefoot Composts is a family-run business producing an exciting range of eight peat free composts using only the natural resources of wool and bracken sourced from the beautiful Lake District. Dalefoot Composts offers premium composts to meet every gardening need – Wool Compost for Potting & Containers, Wool Compost for Vegetables & Salads, Wool Compost Double Strength, Wool Compost Ericaceous (and Double Strength) and Wool Compost for Seeds. Lakeland Gold, the original bracken compost, is a renowned clay buster and high potash feed. Dalefoot Bulb Compost is available from www.dalefootcomposts.co.uk priced from £8.99 down to £7 per bag depending on size of order. Delivery extra. Place a layer of crocks at the bottom of your pot or container. Add a layer of Dalefoot Bulb Compost to a good depth (10cm if possible), to allow good root growth. Arrange bulbs-up to a bulbs distance apart-then add another 10cm layer of bulb compost. Water after planting & continue to water for six weeks after flowering. The compost should feel moist to the touch but not wet. Prepare the ground- remove weeds and add Dalefoot Bulb Compost to the planting pit- which should be 3-4 times as deep as the bulb itself. Cover generously with bulb compost. Mark the place of planting with a beautiful label to prevent disappointment in the future. If you have squirrels in your garden- plant deeper! Top Tip- Try layering your bulbs for a beautiful display. Remember that bulbs with indents e.g. Fritillaria, need to be planted on their side- the stem will find its way up to the light.